While eating at a Mexican restaurant not long ago, a fellow diner who has been to Mexico several times mentioned that one dish on the menu — huevos rancheros — is a popular dish in that country. 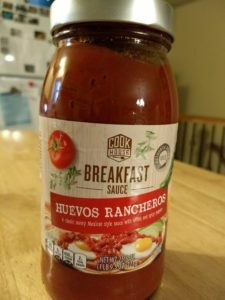 I didn’t order it at the time, but Aldi caught my attention recently when a jar of Cook House Huevos Rancheros Breakfast Sauce showed up as a Special Buy (ALDI Find). I bought a jar to try at home. Cook House appears to be a newer house brand at Aldi. Other Cook House products include a fajita skillet sauce, Korean bulgogi sauce, a roasted chicken sauce, hot sauce, and moonshine sauce. Aldi’s Cook House Huevos Rancheros Breakfast Sauce comes in a 25.5-oz. glass jar and is described as a “classic savory Mexican style sauce with onions and spicy peppers.” Huevos means eggs in Spanish, by the way. The sauce is described as mild, and I would agree; it is not spicy. One 1/4-cup serving nets you 30 calories, 0 grams of saturated fat, 450 mg of sodium, and 2 grams of total sugars. 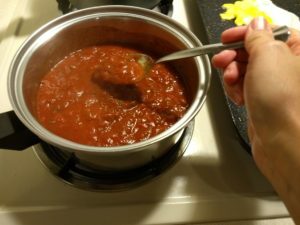 Ingredients are: Tomato puree (water, tomato paste), green bell pepers, diced tomatoes in tomato juice, jalapeno pepeprs, red chili puree (red chili peppers, salt, citric acid), salt, soybean oil, dried onion, dried red bell peppers, cumin powder, and dried oregano. The jar contains a recipe/serving suggestion. Lightly fry two corn tortillas in a saute pan with oil; keep to side. Fry eggs to desired texture. Place tortillas on plate and top with refried beans and fried eggs. Pour warmed Cook House Huevos Rancheros Breakfast Sauce over top. This recipe makes one serving. The entire jar makes about 12 servings. I followed the suggested recipe, but I used flour tortillas instead of corn because my family prefers them. I warmed the huevos rancheros sauce in a sauce pan on the stove top and spooned it over the top of warmed tortillas topped with refried beans and fried eggs. I then topped it all with sliced avocado and served a prepared box of Old El Paso Spanish rice on the side. (Aldi used to sell a Spanish-style rice, but I can no longer find it in stores.) I bought all the other ingredients for this meal at Aldi. I put two fried eggs in each tortilla (if I had used corn tortillas, which are smaller, I would have put one egg in each tortilla). My family found that one tortilla was very filling and packed a protein punch with the two eggs and the refried beans. Instead of eating this meal for breakfast, we had it for dinner, or brinner. The sauce tasted like a cross between salsa and a typical red sauce that tops burritos/enchiladas in Mexican restaurants. I cannot speak to how authentic the taste is because I’ve never had huevos rancheros before, but my husband, my 10-year-old, and I all enjoyed this dish. My picky 7-year-old didn’t care for the sauce and filled up on eggs instead. It could perhaps use a little salt — which the recipe recommends — and which I did not use but probably will next time. The jar of sauce, by the way, is large. Our family of four only ate about half of the sauce, and I put the rest into a plastic container in the freezer to use later. Aldi’s Special Buy (ALDI Find) Cook House Huevos Rancheros Breakfast Sauce comes with a suggested recipe on the back of the jar that involves fried eggs, refried beans, and tortillas. 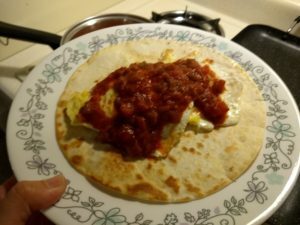 I have never eaten huevos rancheros before, so I cannot say how authentic Aldi’s sauce is, but my family found this to be a tasty and filling meal. The jar contains enough sauce that we will get more than one meal out of it. If you like Mexican food, this is worth a try.